I’ve been crocheting the granny square picot afghan for the past year. 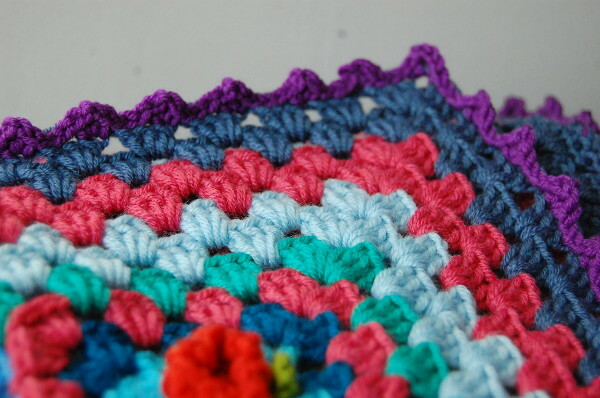 Like the two blankets before it, this blue-purple-red-green-yellow combo was a treat to make. 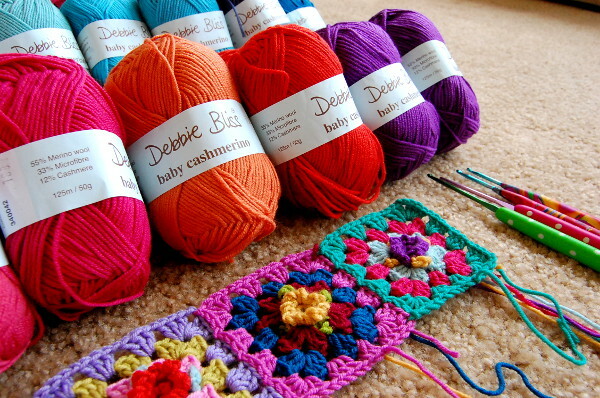 The 3-D granny squares have raised centers that look complicated, yet become easy after the 80th repeat. (If you’d like to try your hand at making a square, you can with this picot granny square video tutorial). A few weeks ago, I finished crocheting the blanket based on Lucy’s original design. I had just ended my last square when I realized there was enough yarn to make another repeat–which would mean three additional rows. 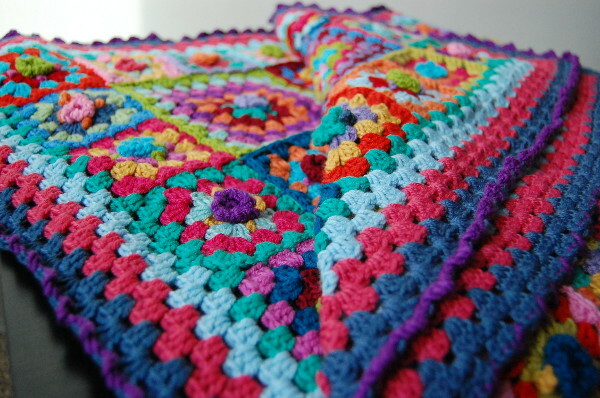 The ‘inspiration afghan ‘is a rectangle, but adding the extra rows made this one into a square. I forged ahead and am glad I did. I rather like the extra inches since it makes the blanket even longer for maximum warmth. Worth it factor (WIF): YES! 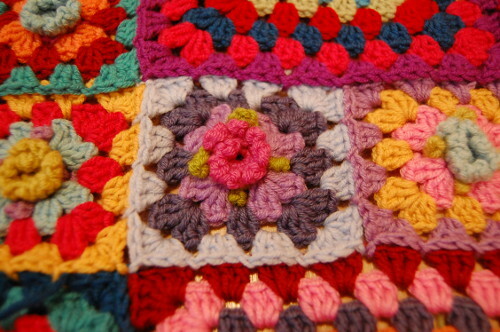 Loved learning how to make the raised granny square flowers. Could be my favorite blanket of the bunch. My favorite part of designing this afghan was not using the same bordering color for a square in any given row OR column. It was like playing sudoku. I even enlisted the help of my roommate. We’d pause the episode of Friday Night Lights we were watching (hello, Tim Riggins) and whisper to ourselves, “light pink…? no. maroon?….. no. Ooh – navy!” as we’d scan the rows and talk through color options until finding a suitable choice. Adding on the three extra rows, I didn’t think it was possible, but without any real planning it worked out. 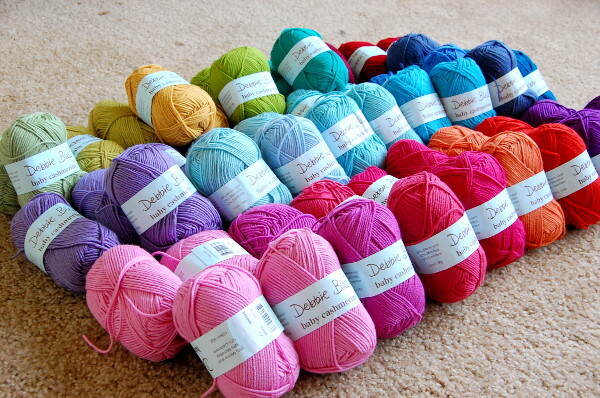 A rainbow afghan of totally random colors. Afghan edging is a faux-picot stitch repeat of [3 slip stitch,es *sc, ch 2, sc* in next stitch ] around. I’m packaging up this afghan tonight and am sad to see it leave, though it’s going to a good home, joining its hexy and ripple afghan sisters. Keep the faith, dear reader, as there is already a fourth afghan in the works. The kaleidoscope continues! Hello, friends! 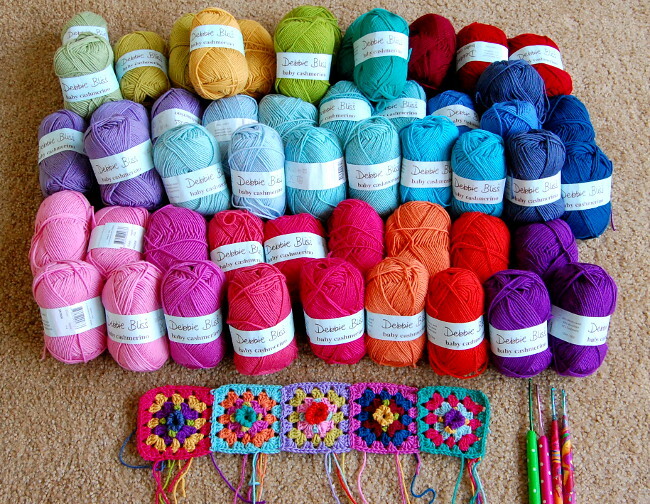 As you might know, I’m currently crocheting another multi-colored afghan, as inspired by Lucy’s design from Attic 24. After requests from fellow crocheters about how to go about making this beautifully unique picot flower granny square, here it is! With first color, chain 3, sl st to form ring. Round 2: Ch 3, sl st into first ch (first picot). * Working in front loops only, sl st in next stitch. ch 3, sl stitch in previous sl st made (picot). * Work from * to * around until you have eight, ch-3 picots. Round 3: Change to second color if desired. Ch 1 + 4 (counts as sc + ch 4). Sl st into top of sc to form first picot. *Working in back loops only of Round 1, sc in next stitch. Sc, work Ch 4, sl st in sc (picot). 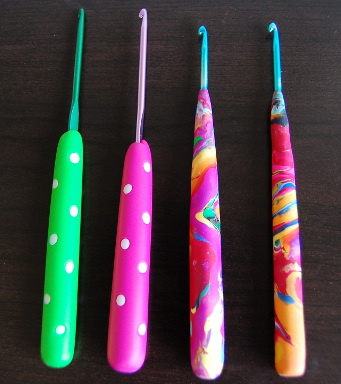 * Work from * to * around until you have four, ch-4 picots. Round 4: Chang to third color if desired. Ch 2 (counts as first dc). Work 2 dc, ch 2, 3 dc into sc in between ch-4 picots from previous round. *3 dc, ch 2, 3 dc into sc between ch-4 picots. * Work from * to * around twice more until you have four corner spaces of 3dc, ch 2, 3dc. Round 5: Change to fourth color if desired. Ch 2 (counts as first dc. Work 2 dc into same space. Ch 1 *3 dc, ch 2, 3 dc into ch-2 corner space of previous round. Ch 1. Work 3 dc into space in between corners from previous round. * Work from * to * around. Round 6: (Not pictured in video). Change to fifth color if desired. Ch 2 (counts as first dc. Work 2 dc into same space. Ch 1. *3 dc, ch 2, 3 dc into ch-2 corner space of previous round. Ch 1, 3 dc into next space. Ch 1, 3 dc into next space. * Work from * to * around. What are you planning to make with this pattern? 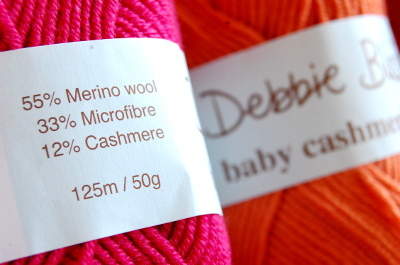 Are you also making an afghan or using the square for something else? I’d love to know! 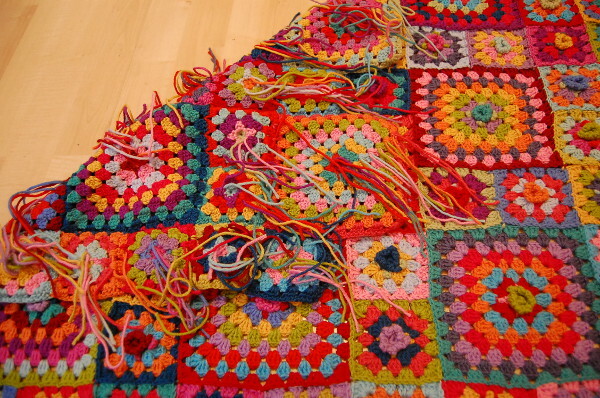 The last time I shared a picture of the granny square picot afghan, it was 18 squares big. Such a baby! 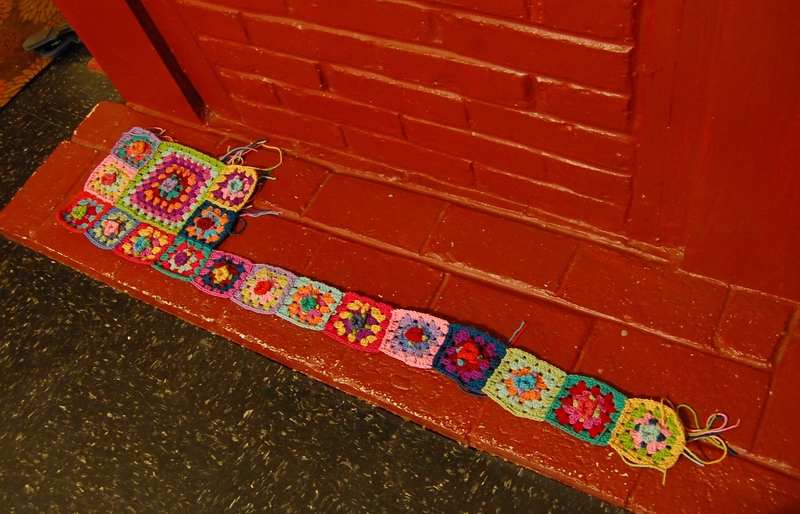 It’s grown quite considerably in the last couple months (to 76 squares) as I’ve found these cold winter months in PA are great for movie-watching and couch-crocheting. All that’s left to do is make 18 more squares, crochet a couple rows for a border and sew in loose ends, which at 10 ends a square to sew in, it’ll be a task in itself. Expect a project recap and “hooray, it’s finished” pictures soon! 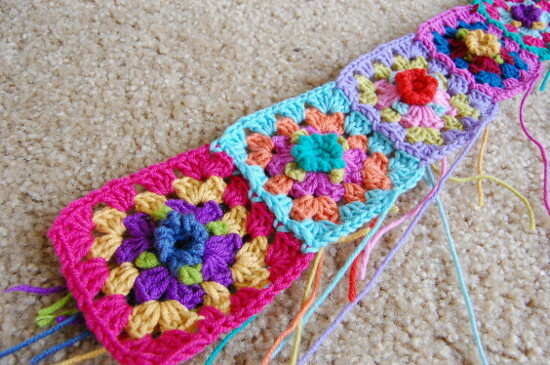 In March, I shared the beginning of the granny square/picot flower blanket. 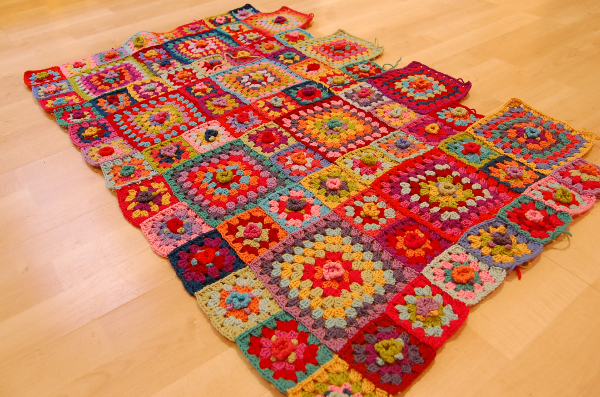 Since then, the blanket has grown from just 5 squares to 18 beautiful rainbow squares, including a large 8-rounder. Each little square is 4 x 4 rounds of granny, but the larger square takes up twice that, so 8 rounds–or the size of two squares. Non-coincidentally, the release of Arrested Development, Season 4 has seem to cause an exponential growth in my available crochet time. I am enjoying quiet nights at home with this project and Netflix. 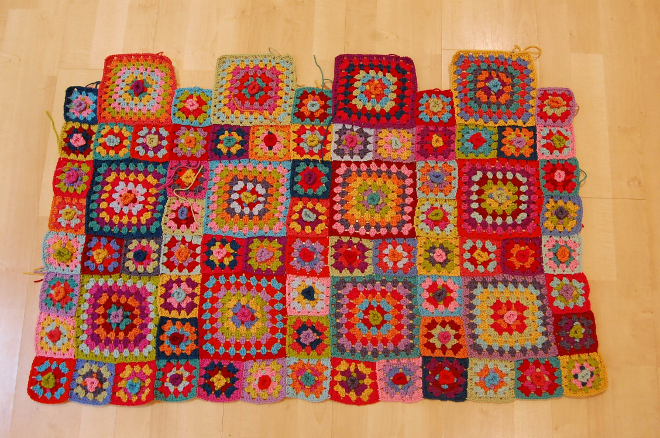 Progress pictures for those wandering how the blanket is growing. I’m planning to have a couple more squares added by the end of the week. Spring keeps trying to make its way to Cleveland, such a brave little guy. Persistently optimistic, yet unsuccessful. The weekend was 72 degrees and blissfully sunny, while today saw snow flurries and temperatures below freezing. 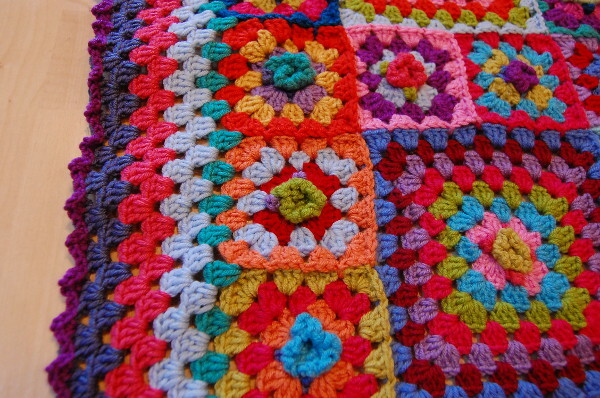 I couldn’t think of a better way to help lure the warm weather to stay than crocheting another cheery afghan. It’ll belong to the same family as the ripple blanket from a few months ago and the hexagon afghan I finished in 2011. 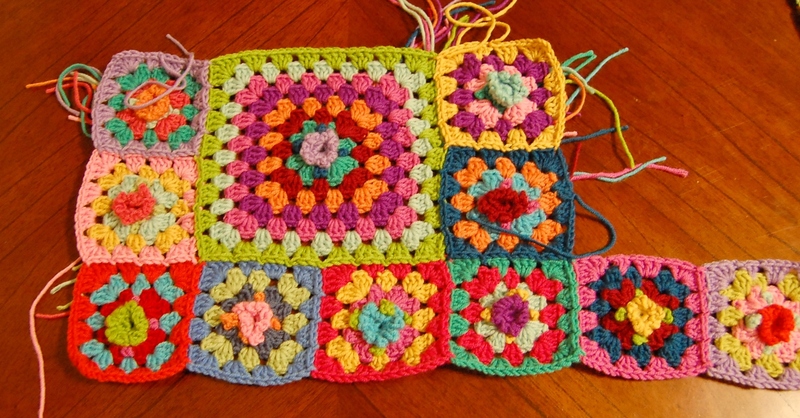 I was commissioned with creating this rainbow granny square based off Attic 24’s lively design. Beyond the lively play of colors (and getting to use my fantastic new hooks), what makes this afghan great is that it’s not your typical granny square blanket. 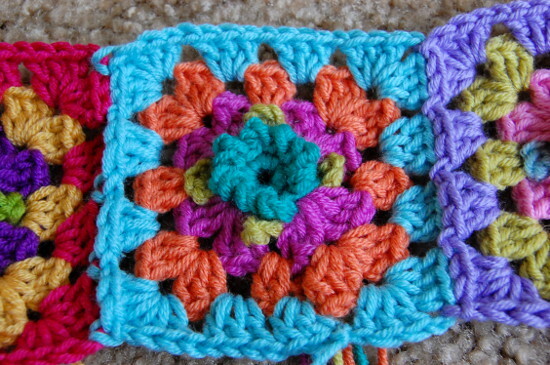 The center of each square starts with an 8-petal picot flower (chain 3 picot) and 4 leaves peaking out the sides that replace the center round of the “typical” granny. I started the pattern this past weekend and have 5 squares to show for my work. I’m already in love. 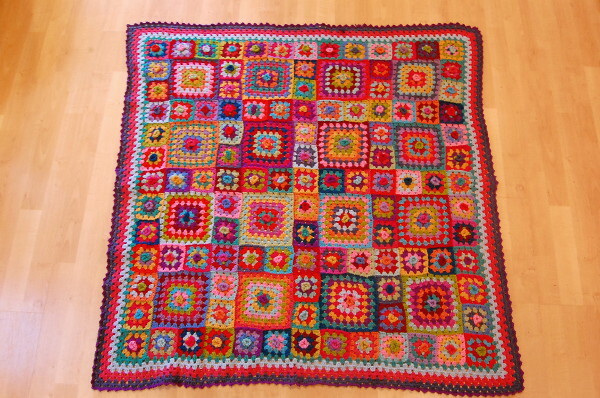 The colors, joining each square as I go, and the slightly raised flower-centers have the potential to make this afghan a unique, brimming-with-life, custom treat. I’ll share pictures as the afghan grows so you can monitor my progress along with me.